To improve the health and wellness of low-income, underserved people through quality healthcare delivered in an atmosphere of dignity and respect. Compassion – We strive to show respect and concern for others at all times. We seek to understand the circumstances, cultures, beliefs, and viewpoints of others. We celebrate the contributions of others, and we promote a peaceful, caring and safe community. Quality – We set high standards in all we do, developing and implementing exemplary policies and practices wherever possible. We deliver outstanding service to our patients and those with whom we partner. Professionalism – We adhere to courtesy, honesty and responsibility when dealing with all individuals and organizations. We complete tasks in a timely manner with the highest quality possible and take pride in completed tasks. Community – We recognize the importance of the larger community around us in enabling us to carry out our mission. We build and foster healthy relationships and partnerships with other organizations. We strive to be an example of a community that plans well and cares well for vulnerable populations. Opening in 1993, the Lloyd F. Moss Free Clinic (operated by the Fredericksburg Area Regional Health Council, Inc.) is a 501(c)3 nonprofit organization that provides comprehensive health care free of charge to the low-income, uninsured and underserved adults who reside in the Fredericksburg region. With the assistance of hundreds of volunteers, the Clinic provided 11,050 patient visits to 1,892 people in 2018. Additionally, 41,000 prescriptions were filled by our on-site licensed pharmacy. The patient population disproportionately suffers from complicated medical conditions and chronic disease, with approximately 75% having at least one chronic illness. An estimated 30% of patients suffer from diabetes. Over 25 years ago, the Lloyd F. Moss Free Clinic began with medical and non-medical volunteers offering limited services two evenings a week in the Amy Guest Wing of the old Mary Washington Hospital. Over time, the Clinic has evolved into a unique and essential health care provider that is meeting a critical need in our community. As the demand for services ballooned and the number of volunteers has grown, the Clinic has relocated twice and greatly expanded its hours, services, and programs. Today, the Clinic operates five days a week and offers both day and evening appointments in a state-of-the-art facility. In 2018 our team of 560 volunteers, including 175 physicians and dentists, provided over 19,000 hours of care and services such as primary and specialty care, women’s health, dental care, mental health, nutrition education, and physical therapy. Patients have access to free diagnostics and specialized procedures (including surgery and chemotherapy) through Mary Washington Healthcare, Spotsylvania Regional Medical Center, and other essential community partners. Thanks to the volunteerism of local healthcare professionals and donations of in-kind goods and services, the Clinic’s annual budget of $2.2 million leveraged over $30 million of healthcare in 2017. The Clinic receives no federal support and depends on monetary contributions from individuals, organizations, and businesses to serve people in need each year. The Lloyd F. Moss Free Clinic stands as a shining example of compassionate community service, healthcare volunteerism, and philanthropic support. A reflection of the community from which it is hewn, the Clinic proudly delivers regular, quality, life-sustaining and often life-saving health care to thousands of area residents who would otherwise likely go without. Dr. Lloyd F. Moss, Sr. was a physician and leader in Fredericksburg for more than six decades. He was one of the founding fathers at Pratt Medical Center and retired from his practice at Pratt in 1989. Not one to idle his time away, Dr. Moss saw the need to provide healthcare for the uninsured and poor. To meet this end, he helped found the free clinic which bears his name, the Lloyd F. Moss Free Clinic. In 1994, just a year after the Clinic opened, Dr. James Shield, then-president of the Medical Society of Virginia, presented the Wyeth-Ayerst Physician Award for Community Service to Dr. Moss at the MSV’s annual meeting. In doing so, Dr. Shield said Dr. Moss was being honored because “he exemplifies one of the finest things that a physician can do and he has done it exceptionally well. He has been a leader in Virginia in something that we are extremely proud of – the free clinic movement”. 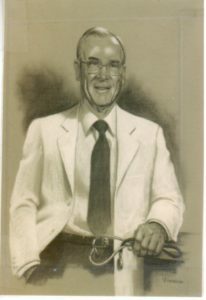 A graduate of Hampden-Sydney College and the Medical College of Virginia, Dr. Moss served the U.S. Army from 1941-46, attaining the rank of major. He worked at McGuire VA Hospital until February 1948 and at Children’s Hospital in Boston until June of that year. At the age of 33, he entered private practice and continued to practice medicine for 41 years. Dr. Moss, who was born and raised in Fredericksburg, died on August 28, 2006, at age 90. The Moss Free Clinic is governed by a 21-member Board of Directors that meets quarterly and is composed of individuals from a broad cross-section of community interests.